After a week at sea my days are starting to have a rhythm. I still find myself on the wrong stairway or deck, or going back for my hard hat, but not as often. Each morning I check the Plan of the Day (POD) and head to the work/lesson planned for the TAS (pronounced TAZ), Teacher at Sea. I am not the only visitor or newcomer on the NOAA Ship Rainier. There are hydrographers visiting from South Korea, physical scientists from the NOAA office in Seattle and new crewmembers. The Rainier has proved to be a welcoming environment. This log will be about my introduction to working aboard ship. 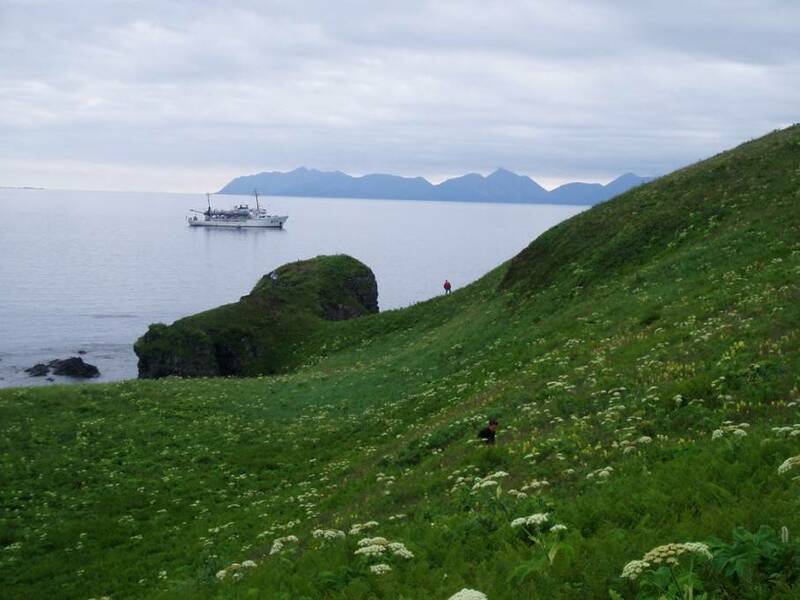 The first order of business upon arriving at our anchorage at Inner Iliasik Island was safety training, and instruction in ropes handling and releasing the launches. Every person on board has a station and job in case of an emergency. Drills are frequent and thorough. Fire drills require everyone to muster and simulate response to a detailed fire scenario. After the drill there is a debriefing, so efficiency can be improved. Everyone on board, including the Teacher at Sea (TAS), must be proficient at handling the ropes. I learned to coil and throw a rope and to tie a bowline. I use those skills each day deploying and recovering the launches. In the morning my jobs are releasing the aft hook as the launch is lowered into the water and catching the aft line and securing it in the launch. In the evening I throw the line back to the ship and secure the aft hook, so the launch can be raised onto the ship. These are straightforward but very visible jobs. Many people are on deck assisting and observing. I made a point of practicing my line handling skills. Physically releasing and recovering the launches is handled by the Deck Crew. NOAA Ship Rainier uses a gravity davit system. The launches literally slide by the force of gravity into the water. The Deck Crew ensures that the slide is controlled and safe. The organization of personnel aboard NOAA Ship Rainier was initially confusing to me. I’ve gradually come to understand that personnel are organized into five groups: NOAA Corps Officers, Survey Technicians, Deck Crew, Engineering, and Stewards. Each group has basic responsibilities. NOAA Corps Officers direct operations and navigate the ship. They also work on the survey team. 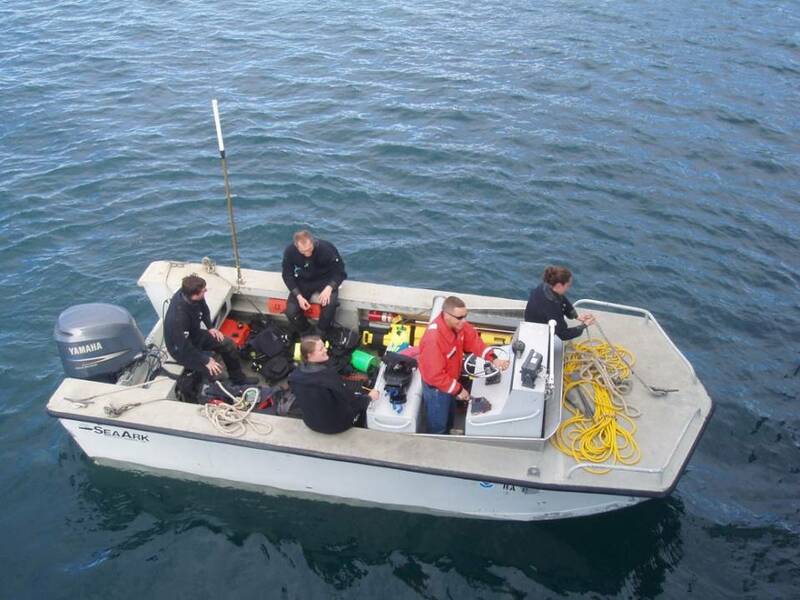 Survey Technicians, the science crew, are employed by the Department of Commerce to conduct hydrographic surveys. Members of the Deck Crew fit my image of true mariners. They maintain the ship, deploy and retrieve the launches, assist with navigation and drive the launches. Engineering keeps the ship running and maintains the engines in the ship and launches. The stewards manage the food supply, and the food is excellent aboard the Rainier. These descriptions are somewhat oversimplified. In reality every crewmember seems to have a wide range of skills, and there is overlap amongst the departments. A great example is the divers. There are seven or eight certified NOAA divers on this leg. They come from all departments: officers, engineering, deck and survey. The Dive Master is a member of the Deck Crew and also part of the specially trained firefighting team. Divers are required to log a dive at least once every six weeks. 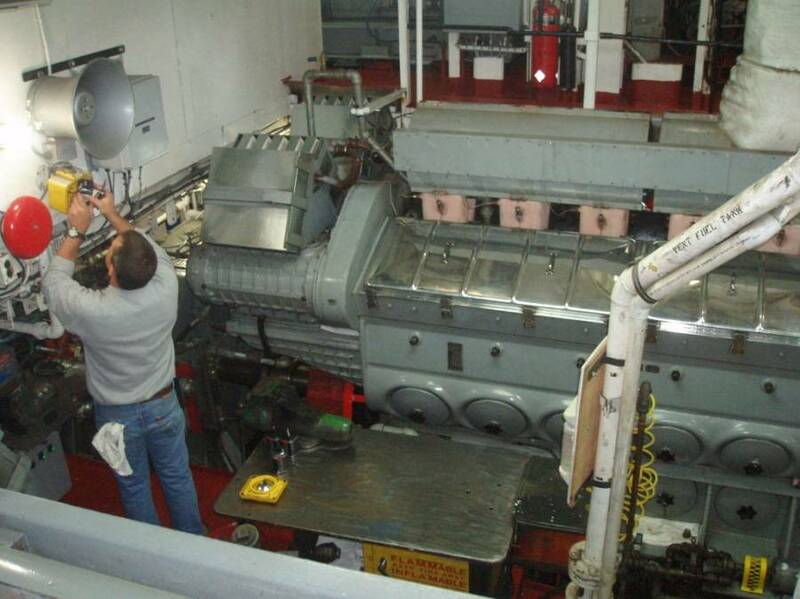 They have opportunities when hull inspections are required, or tide gauges must be installed. Occasionally they dive on their own time, for fun. I took pictures of a Dive Team preparing to test some new equipment. In the course of almost two weeks at sea, I’ve toured the ship from bow to stern and talked with most of the people on board. It has been fascinating to investigate the engine room, listen to stories and talk with mariners of all ages. Today, the engineering group enthusiastically showed me around below decks. In their words, “this is the control center,” and indeed they have a room-sized control panel with access to engineering diagrams and controls for the whole ship. Everything was scrupulously clean and accessible by bright red walkways. I saw the boilers, generators, engines, crankshafts, and plumbing and desalination systems. The desalination system produces the fresh water we use for laundry and showers by distilling salt water. Next, we went to aft steerage, and I saw the giant crankshaft the moves the ship’s rudder. Everyone aboard seems to have a job that is both challenging and interesting. My daily work is with the survey group as I am aboard as a scientist. Everyone in this group has a science or technology background. As in all of the organizational groups, the science party spans a wide range of ages. Many of the survey technicians are in their twenties. They plan to work for a few years and then go on to graduate school. Several of us are considerably older. It is worth noting that everyone seems to be actively learning new skills all the time, and NOAA provides opportunities for continuing education. 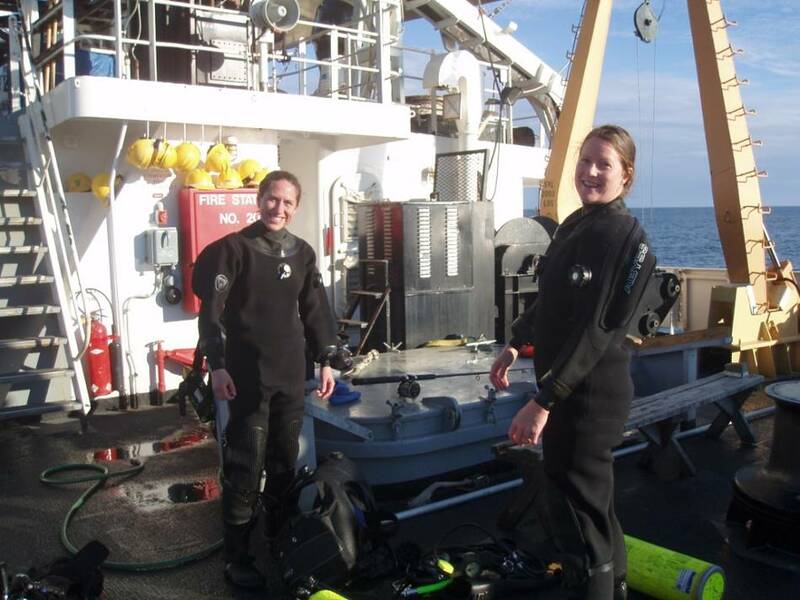 There are jobs on NOAA ships for High School graduates and university professors. My roommate is the Chief Steward. She has been cooking and managing provisions aboard NOAA ships for twenty-nine years. Her job has taken her all over the world. My personal day begins and ends with what I think of as Volcano Check. I scan the horizon in all directions for plumes of smoke or ash. Next I examine all of the nearby visible craters. Just like the ensigns on the Bridge, I am On Watch. 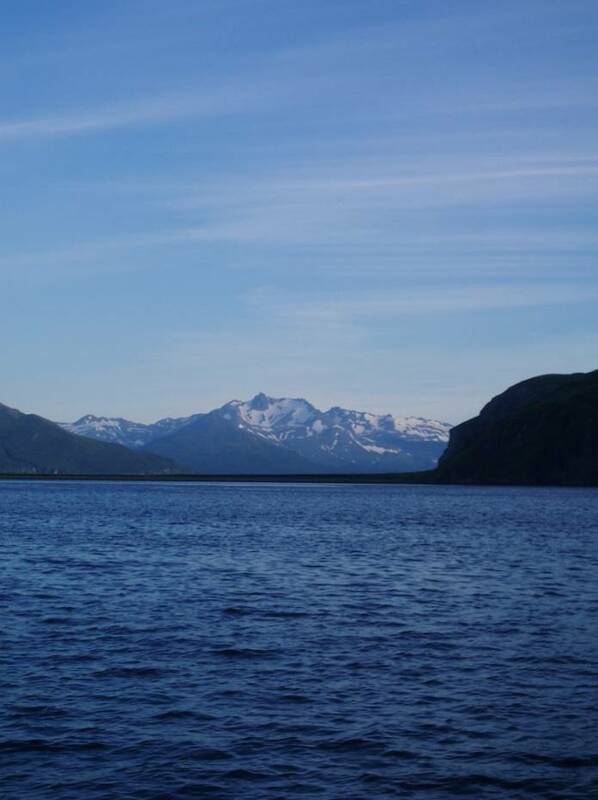 On Fridays I verify my personal observations by checking the Alaskan Volcano Observatory website, where a weekly update on volcanic activity is posted. There you can find detailed information and images of all the active volcanoes. There are instructions for collecting and submitting ash samples. If I were an Alaskan science teacher I would be on the lookout for opportunities to collect ash samples with my students. I may use some of my free time looking at volcanic rocks with binoculars, but I am not the only one. There are at least five people with geology degrees, and an equal number of meteorologists. Out on the fantail the line between vocation and avocation blurs. Twice I have had the opportunity to see the rocks up close, once at a beach party on Inner Iliasik Island and once on an exploratory outing on one of the smaller launches. About once a week the Rainier hosts a beach party with a bonfire. 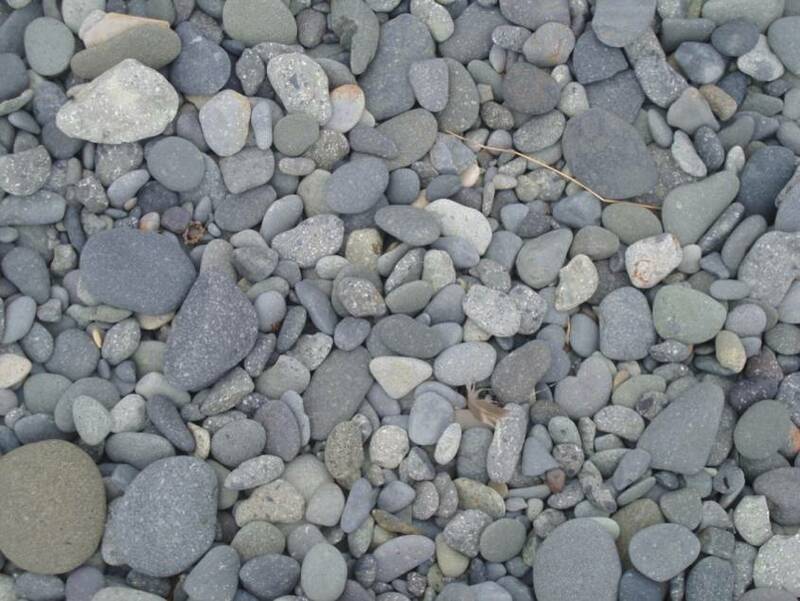 I hiked to the highest point on the island for some beautiful scenery and a close up look at what turned out to be andesitic tuffaceous rocks. On our launch ride we explored caves at Arches Point and entered Long John Lagoon to see birds and bears (unfortunately my camera battery died). The ship also has satellite TV and movies, but on a summer night most people are outside. 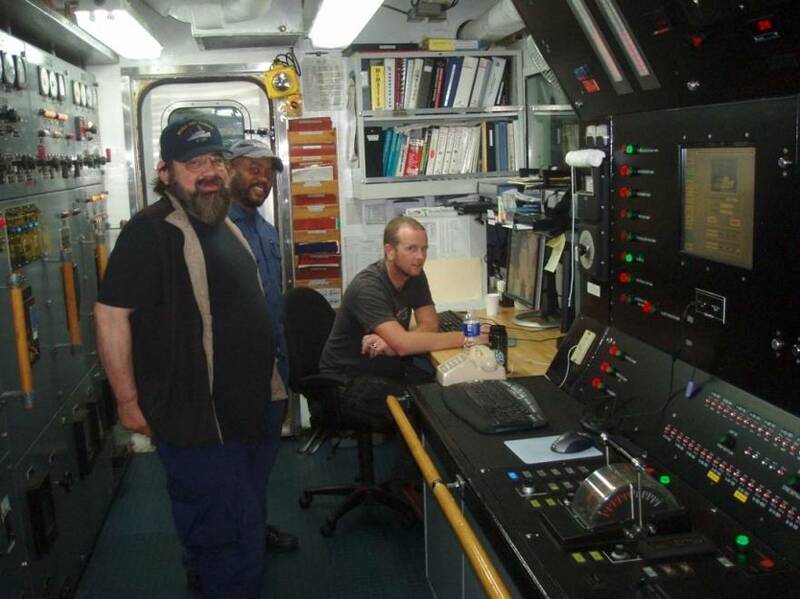 This entry was posted in 2008, Lisa Hjelm, NOAA Ocean Service, NOAA Teacher at Sea and tagged Alaska, Hydrographic survey, launch, multibeam sonar, noaa ship rainier, pavlov islands, ship engine, volcanic crater. Bookmark the permalink.